Who is to blame for Gaza's decade-long ordeal? 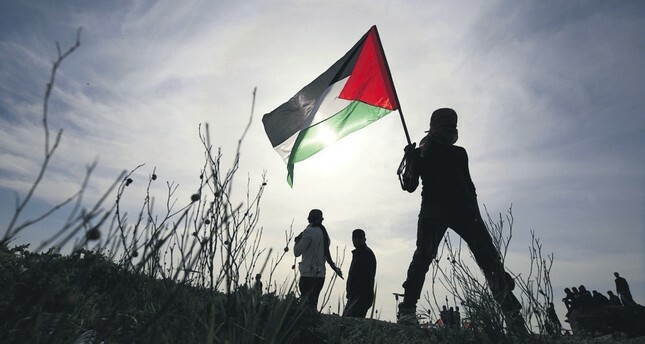 A Palestinian protester holds a Palestinian flag during clashes after Israeli troops attacked protesters near the border between Israel and the Gaza Strip, March 2. Palestine's Gaza Strip has been suffering for the 11th year in a row on all sides and the people's anguish there is getting worse with each passing month. The latest figures provided by Gaza-based international relief organizations revealed that the coastal enclave is about to face a total collapse on various living conditions, most crucially, the health, economic, and educational sectors. Month after month, new threats face the Gazan people who are languishing on a tight 360-kilometer piece of land. The last threat they faced was the U.S. administration's decision to cut the yearly funds for the United Nations Relief and Works Agency for Palestine Refugees in the Near East (UNRWA). Gazans, who to a large extent relied on those funds to manage their daily needs, were devastated. According to official data, Gaza's poverty ratio is among the highest in the world as 80 percent of Gazans overtook the poverty line and unemployment reached 50 percent. Even Gaza's water is not safe for human use. The people are suffering from big power shortages as well; they only get electricity for six hours a day, which badly affects services like sewage-treatment plants. Therefore, the Union of Gaza Municipalities warned earlier in February that the basic services across Gaza would be reduced by 50 percent due to "funding shortfalls." Even the blockaded strip's only means of access to the outdoor world, the infamous Rafah border crossing, is closed almost throughout the year. That makes Gaza, with a population of 2 million people, the biggest prison in the world. The crippling blockade imposed on Gaza dates back to 2006 by Israel, the U.S., and other powers that felt annoyed by the parliamentary election results that saw Hamas come to power. Israel eventually decided to punish the Palestinian people, mostly in Gaza, for freely choosing their representatives. But who is to blame for one of the longest blockades in history, a blockade that ruthlessly targets patients, orphans, students, widows and children. Indeed, the Gazans should not only blame Israel and the international community for their ongoing calamity, they should also blame their Arab brothers and foremost their own leadership. Something that has not been very well circulated on international media is that Egypt, since 2007, has been an integral part of the blockade imposed on the 2 million poor people in the coastal enclave. Since, Cairo has a 13-kilometer bordering strip with Gaza and its territories are connected with the Palestinian areas by the ill-famed Rafah crossing. For the Egyptian leadership, many alternatives were, and are still, available to break the siege over Gaza. At least they can help establish a humanitarian corridor to enable the needy to receive treatment in Egyptian hospitals or even abroad. It is true that Cairo opens the crossing for two to three days once every four months but during this long period dozens of people die and hundreds of students lose their opportunities and scholarships to study abroad. I was one of those students actually. It is noteworthy that only a month after the massacre Israel committed in May 2010 on the Mediterranean - as a result of which 10 Turkish activists were killed while staging an international demonstration against the unfair blockade - Cairo hosted an emergency meeting for the Arab League on the level of foreign ministers. The meeting was concluded with the remarkable decision to break the Gaza siege immediately. It was total sarcasm that the decision was cooked in Cairo on the territories of the second party responsible for Gaza's 11-year tragedy. The decision is yet to go into effect and today, as usual, the Rafah crossing is shut on the face of Gazans. Another side Palestinians in Gaza have to blame for their misery is their own leadership, who behaved irresponsibly. The leaders were not able to call on international actors to stop the siege that goes beyond a mere crime against humanity. Regrettably, Palestinian leadership had been divided, fragmented, and shortsighted on some political differences and narrow partisan interests. They should have been unified enough to confront the Israeli policies that hurt innocent people in Gaza on a daily basis. Rather, the Palestinian leadership represented in the Ramallah-based Palestinian Authority (PA) resorted recently to some measures against the Gaza Strip's people which worsened the already bad situation there. The PA cut the salaries of thousands of Gaza-based employees and reduced the few electricity hours it pays Israel for. The PA's measures were justified by Palestinian leadership as an attempt to push the Gaza-run Hamas to go for reconciliation. For sure, that pretext could be true, but, unfortunately, only Gazan inhabitants bear the brunt. Yes, the Gazan people pay the heaviest price thanks to Israel's extreme arrogance. But they can also thank the international community for turning a blind eye on Israel's daily human rights violations, they can thank their Arab brothers for falling deaf to their daily appeals, and last but not least they can thank their own leaders for their naivety in battling to rule non-sovereign and occupied territories.